this is the time for a second progress report. After the implementation of the button for translations, I've updated the French version of Libervia, and of the new website I'm currently working on (which is not yet online). For now this is done locally using tools like Gtranslator or Poedit, I plan to install at some point a web app like Weblate or Pootle and if possible to integrate is with SàT/XMPP (at least for authentication) to make contributions easier. Beside that I've mainly been working on photos album, I want to be able to use it with 0.7. File sharing is usable either with direct sharing of a repository from a device (e.g. 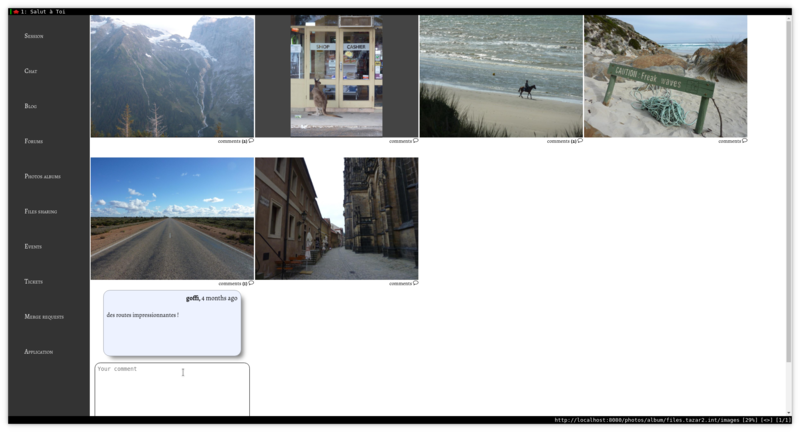 photos from a mobile phone), or with a server component which host files. I've chosed the second one (File Information Sharing) for now because the Pubsub one is based on Collections which is, in my opinion, currently not usable: permissions from collection nodes are overwritting ones of leaf nodes, and as a result a private node can be accidentaly opened. This needs to be addressed, it's not the first time I discard pubsub collections because of that, I'll try to propose changes to standard after the 0.7 release. The other reason I've chosen "File Information Sharing" (FIS) is that the Pubsub one handles mirrors and versions, which I feeled overcomplicated at the time. With FIS, I could make an implementation quickly, and I have a working UI now, which is already quite usable (see this blog post to see how it looks like). But when I'm using the component, I have no way to change access (everything is managed, there is just no interface to change it), so when I put a file on the file sharing component, it stays private for now, not ideal when you want to share a photo album. So I've worked on a quick way to do it, using ad-hoc commands: one to change file/directory permissions, and one to delete files. It's nearly finished and will be the last thing before starting beta phase. That said, Pubsub has already everything needed to manage access and subscriptions (to know when new files/photos are available), so I plan to re-evaluate XEP-0214 at a later point, and if I still find it ill-adapted, maybe propose an other option. I've also noticed a couple of CSS issues on the blog engine (mainly some padding around paragraph would make it easier to read), and I've been noticed that link to Atom feed is missing on the blog. I was planning to fix that this week but could not find the time (I'm working on SàT on my free time). So I hope to do this in the next few days. That's it for this week. I'm looking forward to start debugging phase, and then finally release. I've decided to start writing regular progress notes on this blog, so I can have more feedback from you :). The goal is on one hand to show what is worked on, and on the other hand to explain some technical/design decisions. I'll try to make it weekly, but it's not a promise (maybe this one will be the only one who knows). Also even if I often try to publish both in French and English, this is additional work and I need to focus, so this will probably be English only. For people who haven't heard about the project, Salut à Toi (or SàT) is a communication ecosystem, libre (free as in freedom), decentralised, encrypted, multi-platforms and based on the rock solid XMPP standard. There are numerous features, among which chat, blog, events, files sharing, etc. and even a web framework. You can check https://salut-a-toi.org for details. Cagou is the frontend for desktop/Android, Libervia the web frontend (which include the web framework), jp the command line frontend, and Primivitus the TUI (Terminal User Interface). Let's go with this first weekly progress note. This week I've been working on connection change on Cagou on Android: when disconnected, the backend will try to reconnect every 30 s, this makes no sense when network has been disabled, and would be bad for battery. Now, thanks to pyjnius and android module from python-for-android, backend can check connectivity status, and get notified when there is a change. With those data, the reconnection can be adapted to the situation. This was the last feature I wanted to implement for Cagou. It is now ready for beta. I'm already aware of a couple of troubles, they will be corrected during beta phase. To save some bandwith on connection, roster versioning has been implemented. So far SàT was requesting whole roster (the name of the contact list in XMPP) at each startup, which is not really optimal. Roster versioning lets client keep a local cache, and request only for changes (added/removed contacts) since its version in cache. This was already handled in wokkel that SàT is using, but roster needed to be saved in local storage, and updates to be managed. A jp roster resync command has been added to force a full resynchronisation with server. On Libervia I've added a button to change language. Localisation was already managed in the engine, but not used. An explicit button is needed because there is no good way to auto detect language of user (checking user location is not good for various reasons, and browser language is not good either because user can be using a third party browser in a library for instance), so this needs to be visible and easy to change. Beta version is coming, the last thing I want to implement is a discovery page for photo albums. I've also started to write a new website using Libervia, where I'll move (and improve) SàT documentation, which is currently mainly on the wiki. That's all for today, please let me know if this progress note is useful/interesting, and if it worth publishing it more or less every week. I'll often be at the "XMPP lounge", but I'm also planning to attend some talks and meet people at other booths, so don't hesitate to ping me on the SàT XMPP room sat@chat.jabberfr.org (also available from this link) if you want to talk and/or have a demo. Salut à Toi is in stabilisation phase, and the incoming 0.7 release will bring a new desktop/mobile(Android) frontend, advanced file sharing, events, the basis of a decentralised code forge (tickets and merge requests), OMEMO end to end encryption, etc. A major thing is also the new decentralised web framework, the only one of its kind, which allows you to create website naturaly decentralised, by linking XMPP and Python. 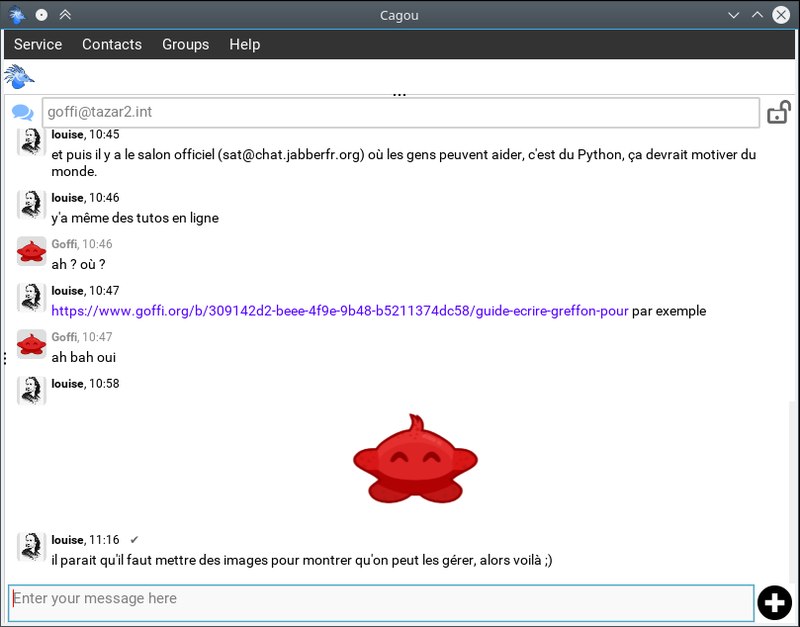 Je serai régulièrement au « XMPP lounge », mais je compte aussi voir certaines conférences et autres stands, aussi n'hésitez pas à me pinguer sur le salon XMPP sat@chat.jabberfr.org (accessible également via ce lien) si vous souhaitez discuter et/ou une démonstration. Salut à Toi est en cours de stabilisation, et la version 0.7 à venir verra l'arrivée de la nouvelle interface bureau/appareils portables (Android en particulier), du partage de fichiers avancé, des événements, de la base d'une forge décentralisée (tickets et « merge requests »), du chiffrement via OMEMO, etc. À noter aussi l'arrivée d'un cadriciel (framework) web unique en son genre, puisqu'il permet de créer des sites naturellement décentralisés en liant XMPP et Python. Au plaisir de vous voir ! Pour les libristes habitant près de Lille, je serai à la Pycon cette semaine avec 2 jours de sprint autour de « Salut à Toi », puis une conférence le samedi à 16:30. Si vous n'allez pas à la Pycon (et même si vous y allez ;) ), on peut aussi se voir pour une petite bière dans le vieux Lille en soirée. Bref n'hésitez pas à me contacter si vous voulez parler décentralisation, réseaux « sociaux », XMPP et/ou politique ! Time is running so fast that I can barely find some to write about the advancement of Salut à Toi, and there's a lot to say. I'll be short this time (no more long list of features like alpha release ;) ). If you are following SàT for long time, you may remember the experiment to have an universal remote control, and the demonstration with VLC. Well, this is now implemented in a cleaner way, and it's user friendly. With Cagou running on your mobile device, it's quite useful as you can see in the video below. Note: I'm testing Peertube to diffuse SàT demo videos, you can also see the video on the instance I'm trying. If you have already SàT running on your desktop, all you have to do is run your media player (VLC for instance). Then on Cagou click on the new "remote control" icon, and you should see an icon for your media player. Note that this is working only on GNU/Linux (and probably *BSD) as it is relying on D-BUS which is not available everywhere. The other thing to mention is that OMEMO support is now available in SàT (thanks to the work of Syndace on python-omemo, and his prompt reactions to feedback). It's not fully finished yet: fingerprint management is missing, encryption is only available on one2one conversations, and it's not yet available on Android, but the biggest part is done and working on desktop. That's it. I'll publish a new alpha release in a couple of days. The list of features to implement before release become narrow, stabilisation phase should start soon. Once again help is needed for packaging (Debian, Arch, or other GNU/Linux distributions, Docker, etc. ), testing/packaging on many platforms (*BSD, Windows and Mac for instance), and would be welcome for development too. Also we have a very low visibility, don't hesitate to shout out loud about the project :). Salut à Toi 0.7 alpha: contributors, take your keyboards! It's my pleasure to announce the release of the first alpha version of Salut à Toi 0.7. This is the occasion on one hand to show the state, advancement and direction of the project, and on the other hand to launch a call for contributions. In this article I will show you a part of Salut à Toi capabilities, and explain briefly how to use them. You'll find a link to an .apk file to test Cagou on Android in the "Test it!" section. As a reminder, Salut à Toi is a collaborattive ecosystem, which is multi-frontends (web, desktop, mobile devices, terminal, command line), multi-platforms, and multipurpose. It let you handle your communications, organise yourself, share your files, etc. It is also, and above all, an activist project which think about the impact of new technologies on our lives, and which tries to stimulate public debate. We'll concentrate on the web and desktop/mobile frontends, because those are the ones which will most probably be of interest to the mass. Libervia has seen major changes, with a new web framework. The idea, which has been explained in a blog post is to offer base components (account authentification, permissions, comments, etc.) ready-to-use and decentralised thanks to XMPP. This way we easily build website which are automatically decentralised and federated. Please note that everything is prepared for translation, but for now only English is available. Help would be much appreciated to improve on that! Let's start with the most obvious, there is an instant messaging page. To use it, you just have to click on "chat", et to log in if it's not already done. You'll land on a panel with the rooms in your bookmarks, you just have to click on one of them, or to specify an identifier (jid) of a new room/contact. It is for now quite basic, but still you can enter "/help" to check textual commands. One of the flagship features of SàT, really rare in XMPP world (the only actively developed other client implenting it being Movim), is the blog (which is then decentralised). A click on the menu will bring you to a "discover" page where you'll find your contacts with a blog. Click on one of them to read, or specify an identifier to read a blog which is not in your contacts. Unique feature in XMPP world, SàT propose forums, allowing to organise discussions in categories. Because forums are under the hood the same thing as blogs, it is possible to use a blog as forum and vice versa. The addition of new forums is done by an administrator using command line tool "jp" (see below). Other feature not seen elsewhere in XMPP (and in decentralised software? ), SàT allows you to create events, and of course to invite people. 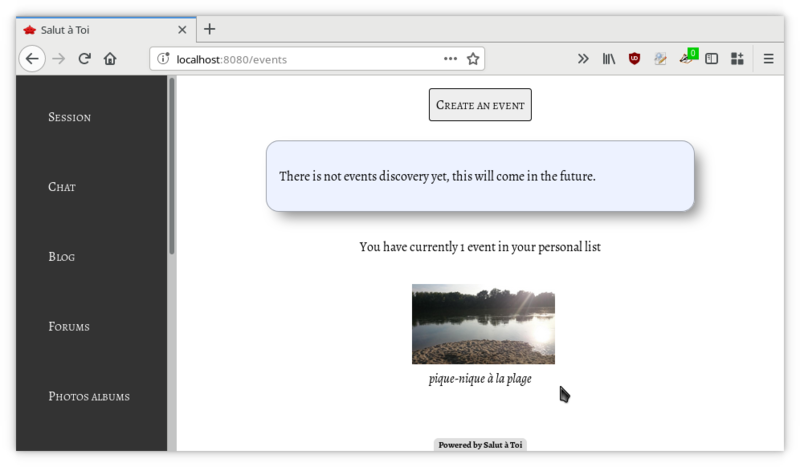 As with other features, the page is thought to be easy to use: you have a button "create an event" which bring you to a form. A name, location and date later (and optionally a picture to associate), and your event is created. You'll then land to an admin page where you'll have the possibility to invite people. Events are private for now, only your guests and you have access to it, but public events are also planned. Please note that it's possible (but not yet from the web interface) to add arbitrary fields to your events, for instance to let your guest specify what they'll bring to a picnic. Here we are talking about a feature useful daily, and in many circonstances. Salut à Toi has long been able to send files, or to upload them on your server, but we are talking here about sharing one or many directories, or to upload in an advanced way on a serveur component. you are home, you've just taken a video and some photos on your phone that you want to get on your computer. You have installed Cagou, the desktop/Android frontend of SàT on your device and already shared your photo directory. From your desktop computer, in the "file sharing" mode you see your device and you can directly download the video and the photos from there. The connection will be done directly on your local network, from device to device, and your files will not go throught a external server located whoever knows where. you have files that you want to access at any time from anywhere (pictures or working documents for instance). You put them in a virtual directory on your file sharing component (a SàT instance too) and you can access it as simply as for the previous example. Note that while with Cagou the connection is done directly when possible, it's not the case for Libervia which will first download the file on the server, before taking it throught HTTPS. WebRTC will be needed for the direct connection, and that's planned for 0.8 release. Permission are handled easily: you specify who can access your files in a couple of clicks. Files are transfered in clear for now (unencrypted), but this should not be the case anymore once finale release is here. Based on previous feature, a photos album mode display a directory containing only photos with adapted view, an with comments. Permissions are really useful here, allowing to let, for instance, only your family see an album. It's not yet possible to access an album from the interface of Libervia, to test it you'll have to change the URL by hand from the file handling page (by replacing files/list by photos/album). Developed from our own needs, SàT now handles tickets in pretty much the same way as a code forge. This is classical issue tracking, bugs report, tasks to do, etc. Fields are free, it's really easy to use this feature for any kind of list: TO-DO tasks, but also, for instance, shopping lists. In the same spirit as tickets, SàT also handle "merge requests". Developed and used primarly for SàT itself, this system has the benefit or not being tied to a specific tool (like Git or Mercurial). Il is currently used with Mercurial, but it is possible to use it with whatever we want, and I'm not only talking about software code here. Those 2 features means that SàT is a decentralised code forge. Even if it's still relatively basic, it has the benefit of being easy to use, flexible and adaptable. Furthermore there are only a few decentralised code forge at the moment (we can probably count Fossil, maybe some others). Once again, contributions would accelerate things and would permit to have a very powerful tool. To conclude this small tour of Libervia, we have to mention the application which is an entirely dynamic page, more elaborated but also more complicated to use (one of the main base version goal is to be easy to use). Libervia web application allows to use widgets that you can drop next to each other, to do end to end encryption (OTR), or to publish blog post in simple or WYSIWYG mode, with the syntax you like (Markdown for instance). It's the historic application which, for technical reasons, is now under minimal maintainance and have a few issues (like the contacts which can appear 2 times as seen in the screenshot above). It will be re-written for SàT 0.8, but it's let in place in this release for people who want to use it. Promised after the success of our crowfunding campaign, which allowed us to get a bit more than 3000 €, Cagou is our new frontend for desktop and Android devices. Its goals are to be modern, easy to use, and powerful. 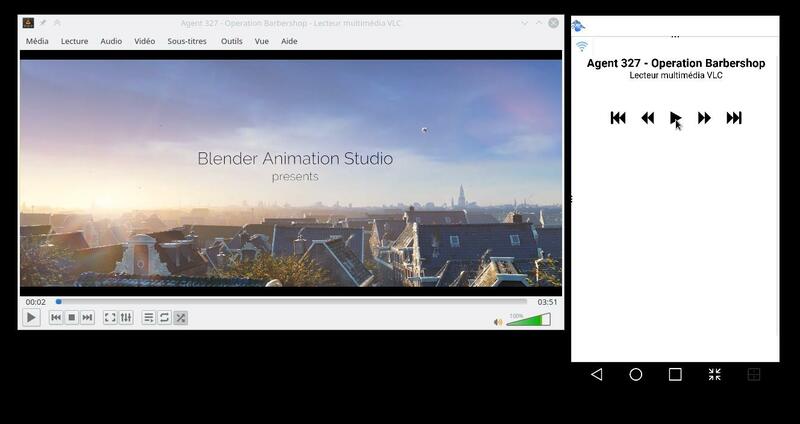 Its original UI is inspired from Blender, and let split the screen to show several widgets at once. This UI has been thought in a way that it can be used even without knowing this split capacity, while being straightforward to use once the feature has been discovered. To change mode, you just have to click on the top left icon. For now, 5 modes are available: chat, contacts, file sharing, widget selector, and settings. On the very top, you have a menu (only on desktop), and a notification zone, where messages appear for a few seconds and are visible entirely when clicking on the head of the left Cagou. On the other side, an other Cagou head can appear when you get notifications needing a user interaction (new contact for instance, or authentification request – see below –). This way, no popup will steal your focus while you are writing a message or doing something else. It is possible de split the screen as much as you want by clicking on the 3 dots area (on top and left borders), and then moving your mouse/finger. If the bar is red, this means that you'll close the area. You can organise the way you want, and monitor several things at the same time. In the future, it should be possible to keep handy widgets organisations so you can re-use them easily. The chat should be relatively intuitive. The top area show the current room or the identifier (JID) of the person you're talking to. It is possible to enter an other identifier manually to change room. For instance you can enter sat@chat.jabberfr.org to come on Salut à Toi room. Still on the top area, the "padlock" icon on the right (only visible in 1/1 discussions) allows you to encrypt the conversation end to end, with OTR only for now (see below). If you have several discussions at the same time, you can switch from one to the other by swiping your finger horizontally. Only discussions not already visible somewhere on the screen will be available, and for now they are in alphanumeric order (most certainly recent discussions will be available first when stable release will be out). Finally, in the bottom area, in addition to the text input, you can see a + button with a circle which allows you to open a media transfer panel. On the desktop for now you can only select a file from your file-system, but on Android you can select/take a picture/video, a file or record an audio message. In every cases you can choose if you want to upload the file on your server, or send it directly to your contact, without transiting by the server. As you can see, you just have to do a long click/touch on the directory or file to share, and to select people which will have access to it. 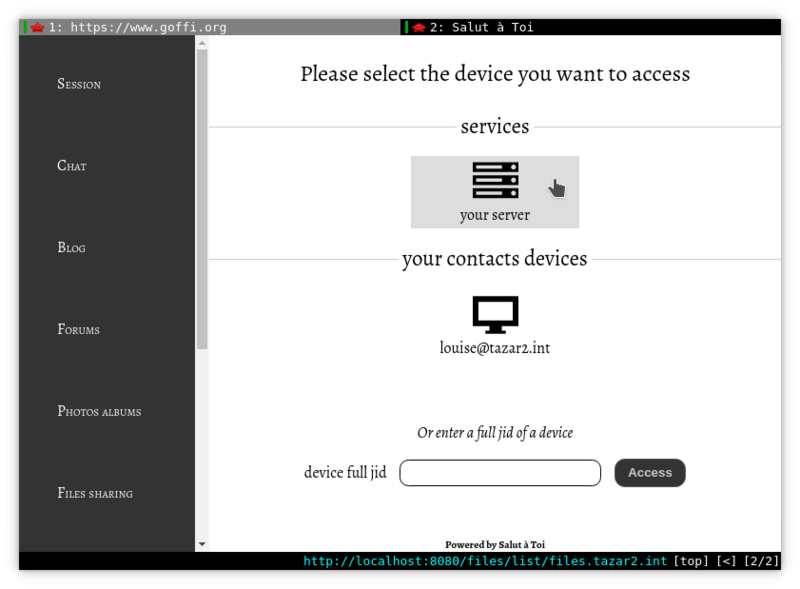 You can click on "share local files" button, in the header zone, to change mode and see the device which are sharing. 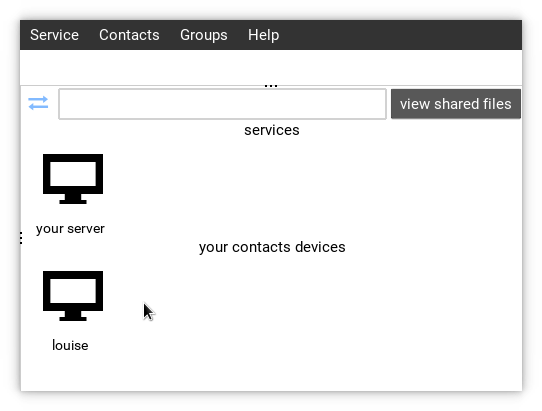 You'll then see – as with Libervia – 3 areas: the first one with sharing component, if any, the second one with your own devices (your phone or desk computer for instance), and finally the devices of your contacts. Once again, the input area let your filter devices to show. SàT is a project which push the use of XMPP in every directions, and this include authentifying on third party websites. The idea is to be able to authenticate yourself without having to create an account on any website just by giving your JID. 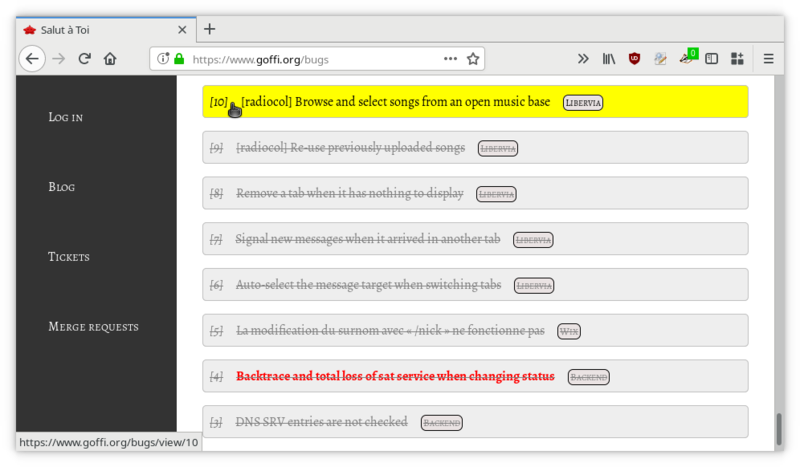 You can implement this in your own website either by using Chteufleur component (Chteufleur is actually the original implementer of the feature in SàT, many thanks), either by using a server where it's already available (it's for instance the case on jabberfr, thanks to the admins of this server). Please note that once it's in place, in your website you just have to do a single HTTPS request to validate authentication. No need to take much time on this mode, but it's good to know that you can add a new contact there (with the top button), or delete an existing one with a long click/touch. A simple click will launch the chat mode with the selected contact. There are far too many new things in jp to describe everything here. when the website generator handle it, you can directly use the blog URL to edit it. For instance, I can edit one of my last posts by using jp blog edit -u https://www.goffi.org/b/khii3yEKWDhmNYSDt5GGrY/vers-forge-decentralisee-basee-xmpp where https://www.goffi.org/b/khii3yEKWDhmNYSDt5GGrY/vers-forge-decentralisee-basee-xmpp is the URL of the HTML generated page. I then have my text editor showing the code of my page on one side (in my favorite syntax) and the metadata on the other. Note the this works with webpage generated by Libervia, but also by Movim. You can test all this, the installation instructions are available (in English only, we are lacking resources to translate) on the wiki by clicking here. SàT (backend + jp (CLI) + Primitivus (TUI)) is available in Debian experimental (thanks to Robotux, Naha, Debacle and other packagers). We got confirmation that SàT and Cagou are working on Mac OS X (thanks to xma), we would like help of people to also test it on Windows, BSD*, or anything else. You can test on Android by clicking on this link from your device (installation from external resources must be activated from settings). Oh, and while we are talking about features not yet implemented, there are strong possibilities that end to end encryption with OMEMO will be implemented before final release, thanks notably to the new Python module available (thanks to Syndace, the author). End to end encryption is already available for years in SàT, but only with OTR so far. Let's stop here for the features, but we have not seen all of them. As you can see, there's a lot to play with, and there is enough for every taste in this project. And that's good, with summer holidays you'll have more time, a perfect occasion to contribute to a unique project, ethics and activist. Do not hesitate to come on SàT XMPP room (sat@chat.jabberfr.org, also available without account, from the web). If you are lacking time (picnic on the beach is nice too), support on Liberapay and/or adhering to the association is also helping. Try to spread the word around you, our project lack visibility and needs you. If you are willing to host an instance, you can start to test (in a "experimental/not stable" part of your website), and give us feedbacks. We are also looking for people helping to package in every place where it's possible. Thanks in advance, and see you soon! C'est avec plaisir que je vous annonce la sortie de la première version alpha de Salut à Toi 0.7. Cela permet d'une part de vous montrer l'état, les avancées et l'orientation du projet, mais aussi de faire un appel à la contribution. Je vais dans la suite de cet article vous présenter une partie des capacités de Salut à Toi, ainsi que vous expliquer briévement comme les utiliser. Vous trouverez un lien vers un fichier .apk pour tester sur Android dans la section « Testez ! ». Pour mémoire, Salut à Toi est un écosystème collaboratif, multi interfaces (web, bureau, appareils portatifs, terminal, ligne de commande), multi-plateformes, et multi-usages. Il permet de gérer vos communications, de vous organiser, de partager vos fichiers, etc. C'est aussi, et avant tout un projet engagé qui prend en compte l'impacte des nouvelles technologies sur nos vies, et qui cherche à stimuler le débat public. Nous allons nous concentrer sur les interfaces Web, et bureau/appareils portatifs, car ce sont celles qui sont les plus susceptibles d'intéresser le plus grand nombre. Libervia a entamé des changements très importants, avec l'apparition d'un cadriciel (« framework » en anglais) web. L'idée, expliquée dans un billet de blog est de fournir les composants de base (comptes et authentification, permissions, commentaires, etc.) directement utilisables et décentralisés grâce à XMPP. On construit ainsi facilement des sites automatiquement décentralisés et fédérés. Notez que tout est prévu pour la traduction dans différentes langues, mais que pour l'instant seul l'anglais est disponible. De l'aide serait grandement appréciée pour améliorer cela ! Probablement le plus évident, il y a une application de messagerie instantanée. Pour l'utiliser il faut cliquer sur « Chat », et vous connecter si ce n'est pas encore fait. Vous arrivez alors dans un panneau indiquant les salons contenus dans vos marque-pages, il vous suffit de cliquer sur l'un d'eux, ou d'indiquer l'identifiant (jid) d'un nouveau salon. C'est pour le moment assez basique, vous pouvez toutefois entrer « /help » pour avoir accès à liste des commandes textuelles. Une des fonctionnalités phares de SàT, et peu courante dans le monde XMPP (le seul client activement développé le permettant également étant Movim), est le blog (qui est donc décentralisé). Un clique sur le menu vous amènera sur une page de « découverte » où vous pourrez voir vos contacts ayant un blog. Cliquez sur l'un d'eux pour le lire, ou indiquez un identifiant pour en lire un qui n'est pas dans vos contacts. Fonctionnalité unique dans le monde XMPP, SàT propose un système de forums, qui permet en pratique d'organiser des discussions dans des catégories. Les forums étant en arrière plan la même chose que les blogs, il est possible d'utiliser un blog comme forum et vice versa. La création de forums se fait par un ou une administrateur/ice en ligne de commande avec l'outil « jp » (voir ci-dessous). Autre fonctionnalité unique dans le milieu XMPP (et en décentralisé ? ), SàT permet de créer des événements, et bien sûr d'y inviter du monde. Comme pour les autres fonctionnalités, la page est prévue pour être simple à utiliser : vous avec un bouton « créer un événement », qui vous mène à un formulaire. Un nom, un lieu et une date plus tard (et éventuellement une photo pour le représenter), et votre événement est créé. Vous arrivez alors sur la page d'administration où vous pouvez indiquer les personnes à inviter. Les événements sont pour le moment privés, uniquement vous et vos invités y ont accès, mais des événements publiques sont prévus. À noter qu'il est possible (mais pas encore depuis l'interface web) d'ajouter des champs arbitraires à vos événements, permettant par exemple de préciser ce que vos invités amènent à un pique-nique. Là on touche à une fonctionnalité utile au quotidien, et dans beaucoup de circonstances. Salut à toi permettait depuis longtemps de s'envoyer des fichiers, ou d'en déposer sur votre serveur, mais il s'agit ici de partager un ou des répertoires, ou de déposer des fichiers sur un serveur. vous êtes chez vous, vous venez de prendre une vidéo et des photos sur votre téléphone que vous voulez voir sur votre ordinateur. Vous avez installé Cagou, l'interface bureau/Android de SàT sur votre appareil et partagé votre répertoire photo. Depuis votre ordinateur de bureau, dans la partie « partage de fichiers » vous voyez votre appareil et pouvez télécharger directement la vidéo et les photos. La connexion se fera directement sur le réseau local d'appareil à appareil, vos fichiers ne transiteront pas par un serveur situé on ne sait où. vous avez des fichiers que vous voulez accéder de n'importe où n'importe quand (des photos ou des documents de travail par exemple). Vous les mettez dans un répertoire virtuel sur votre composant de partage de fichier (une instance SàT également, voir plus bas), et vous y accédez aussi simplement que dans l'exemple précédent. Notez que bien qu'avec Cagou la connexion se fait directement quand c'est possible, ça n'est pas encore le cas pour Libervia qui téléchargera d'abord le fichier sur le serveur avant de la fournir en HTTPS. La connexion directe nécessitera WebRTC qui est prévu pour la version 0.8. Les permissions se gèrent très simplement : vous indiquez qui a le droit d'accéder à vos fichiers en quelques cliques. Les fichiers passent pour le moment en clair (non chiffré), mais ceci ne devrait plus être le cas d'ici la version finale. Basé sur la fonctionnalité précédente, un mode album photos permet de présenter un dossier qui ne contient que des photos avec une vue adaptée, et de le commenter. Les permissions sont très utiles ici, permettant de ne laisser, par exemple, que votre famille visionner un album. Il n'est pas encore possible d’accéder à un album depuis l'interface de Libervia, pour tester vous allez devoir changer l'URL à la main depuis le partage de fichiers (en remplaçant files/list par photos/album). Développé pour nos propres besoins, SàT permet désormais de gérer des tickets à la façon d'une forge logicielle. On est dans le classique ticket de suivi, rapport de bogue, tâche à faire, etc. Les champs sont libres, il est ainsi très facile d'utiliser cette fonctionnalité pour tout type de listes : tâches à faire, mais aussi, par exemple, liste de courses. Dans la lignée des tickets, SàT gère également les « requêtes de fusion » (ou « merge requests » en anglais). Développé et utilisé en premier lieu pour le développement de SàT lui-même, ce système a l'avantage de ne pas être lié à un outil particulier (comme Git ou Mercurial). Il est actuellement utilisé avec Mercurial, mais il est possible de l'utiliser avec ce que l'on souhaite, et cela n'est pas réservé au développement de code logiciel. Ces 2 dernières fonctionnalités font de SàT une forge décentralisée. Même si elle est encore basique, elle a l'avantage d'être simple d'utilisation, souple et facilement adaptable, et surtout il n'existe pas ou peu de forge décentralisées à l'heure actuelle (on peut sans doute compter Fossil, et peut être d'autres). Encore une fois, l'arrivée de contributions permettrait d’accélérer les choses et d'en faire un outil très puissant. Pour conclure ce petit tour de Libervia, notons l'application qui vous amènera à une version entièrement dynamique, plus élaborée mais également plus difficile à utiliser, la version de base voulant être facile à prendre en main. L'application web Libervia permet d'utiliser des widgets que vous pouvez déposer côte à côte, de faire du chiffrement de bout en bout (via OTR), ou de publier des billets de blog en mode simple ou WYSIWYG, avec la syntaxe qui vous convient (Markdown par exemple). Il s'agit de l'application historique qui pour des raisons techniques n'est plus qu'en maintenance minimale et comporte un certain nombre de problèmes (comme le contact qui apparait 2 fois, visible dans la capture ci-dessus). Elle sera réécrite pour SàT 0.8, mais est laissée dans cette version en l'état pour ceux qui souhaitent toujours l'utiliser. Promise suite à notre campagne de financement, qui nous a permis de récolter un peu plus de 3000 €, Cagou est notre nouvelle interface de bureau et pour appareils Android. Elle se veut moderne, facile à utiliser, et puissante. Son interface originale est inspirée de Blender, elle permet de diviser l'écran pour afficher plusieurs widgets en même temps. Cette interface a été pensée pour qu'on puisse l'utiliser même sans connaître cette capacité de division, tout en étant évidant à utiliser une fois celle-ci découverte. Pour utiliser un widget, cliquez tout simplement sur l’icône en haut à gauche du widget en cours pour sélectionner un autre. Pour le moment, 5 widgets sont disponibles : chat, liste de contacts, partage de fichiers, sélectionneur de widgets et paramètres. Tout en haut, vous avez un menu (uniquement sur le bureau) et une zone de notification, ou les messages apparaissent quelques secondes (et sont visibles en entier en cliquant sur la tête de Cagou gauche). De l'autre côté, une autre tête de Cagou peut apparaître quand vous recevez des notifications nécessitant une action de l'utilisateur (nouveau contact par exemple, ou demande d'authentification, voir ci-dessous). Ainsi pas de popup qui vole le focus quand vous tapez un message ou autre. Vous pouvez ainsi vous organiser comme vous l'entendez, et surveiller plusieurs choses en même temps. À terme il devrait être possible de garder les dispositions pratiques pour les remettre en place facilement. Le chat devrait être relativement intuitif. La zone du haut indique le salon ou l'identifiant (JID) de la personne avec laquelle vous discutez. Il est possible d'entrer un autre identifiant manuellement pour changer de salon, par exemple entrez sat@chat.jabberfr.org pour venir sur le salon de Salut à Toi. Toujours en haut, l’icône « cadenas » à droite (visible uniquement dans les conversations 1/1) vous permet de chiffrer de bout en bout la conversation, avec OTR uniquement pour l'instant (voir plus bas). Si vous avez plusieurs conversations en cours, vous pouvez passer de l'une à l'autre en balayant l'écran avec votre doigt horizontalement (mouvement aussi appelé « swipe »). Seules les conversations non déjà visibles sur l'écran seront disponibles, et pour le moment elles sont dans un ordre alphabétique (il est fort probable que les conversations récentes soit disponibles en premier d'ici la version stable). Enfin dans la zone du bas, outre la zone de saisie vous voyer un bouton + cerclé qui permet d'ouvrir le panneau d'envoi de médias. Sur bureau vous n'avez pour le moment que la possibilité de choisir un fichier, mais sur Android vous pouvez sélectionner/prendre une photo, une vidéo, sélectionner un fichier, ou encore enregistrer un message audio. Dans tous les cas, vous pouvez choisir si vous voulez téléverser le fichier sur votre serveur, ou l'envoyer directement à votre correspondant, sans passer par le serveur. Comme vous le voyez, il suffit de faire un clique/appui long sur le répertoire ou fichier à partager, et de sélectionner les personnes qui y auront accès. Si vous cliquez sur le bouton « share local files » dans la zone d'en-tête pour changer de mode et voir les appareils qui partagent. Vous verrez alors apparaître – comme sur Libervia – 3 zones : la première avec les éventuels composants de partage, la deuxième avec vos propres appareils (votre téléphone ou ordinateur de bureau par exemple), et enfin les appareils de vos contacts. Là encore, la zone de saisie permet de filtrer les appareils affichés. SàT est un projet qui pousse à l'exploitation des différentes possibilités de XMPP, et notamment l'authentification sur des sites externes. Le principe est de pouvoir vous authentifier sans créer de compte sur n'importe quel site en indiquant juste votre JID. Vous pouvez très facilement intégrer cela dans votre propre site soit en utilisant le composant de Chteufleur (qui est d’ailleurs à l'origine de l'implémentation dans SàT, un grand merci à lui), soit en utilisant un serveur où c'est déjà en place (c'est pas exemple le cas sur jabberfr grâce aux GA – gentils admins – de ce site). Notez bien qu'une fois ceci en place, dans votre site vous n'avez besoin d'effectuer qu'une seule requête HTTPS pour valider une authentification (et ça serait super qu'un lecteur fasse l'implémentation pour LinuxFr). Pas besoin de s'éterniser sur ce mode, mais il est bon de savoir qu'il permet d'ajouter un contact en cliquant sur le bouton idoine en haut. Un/une clique/touche long(ue) permet également de supprimer un contact. Un clique simple va lancer le mode discussion avec la personne choisie. Il y a beaucoup trop de choses nouvelles dans jp pour tout décrire ici. quand le générateur de site le supporte, vous pouvez directement utiliser l'URL d'un blog pour l'éditer. 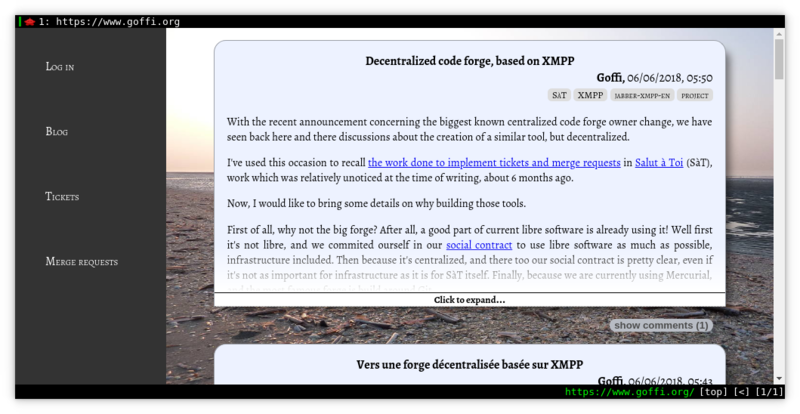 Par exemple, je peux éditer un de mes derniers billets de blog en faisant jp blog edit -u https://www.goffi.org/b/khii3yEKWDhmNYSDt5GGrY/vers-forge-decentralisee-basee-xmpp où https://www.goffi.org/b/khii3yEKWDhmNYSDt5GGrY/vers-forge-decentralisee-basee-xmpp est l'URL de la page générée en HTML. Je me retrouve alors avec mon éditeur de texte affichant le code de ma page d'un côté (dans la syntaxe de mon choix) et les métadonnées de l'autre. Notez que cela fonctionne avec les sites générés par Libervia, mais également avec Movim. Vous pouvez tester tout cela, les instructions d'installations sont disponibles (en anglais seulement, nous manquons de moyens pour traduire) sur le wiki en cliquant ici. SàT (backend + jp (CLI) + Primitivus (TUI)) est disponible dans Debian experimental (merci à Robotux, Naha, Debacle et les autres empaqueteurs). Nous avons eu confirmation que SàT et Cagou fonctionnent sur Mac OS X (merci à xma), nous aimerions du monde pour tester également sur Windows, BSD*, ou autre. Vous pouvez tester sur Android en cliquant sur ce lien depuis votre appareil (il faut avoir autorisé les installations depuis les sources externes). Ah, en parlant de fonctionnalité non encore présente, il y a de très fortes chances que le chiffrement de bout en bout avec OMEMO soit implémenté d'ici la version finale, grâce entre autres à la disponibilité d'un nouveau module Python (merci à Syndace, son auteur). Le chiffrement de bout en bout est déjà disponible depuis plusieurs années, mais via OTR uniquement jusqu'ici. Arrêtons-nous là pour les fonctionnalités, mais nous n'avons pas fait le tour. Comme vous le voyez, il y a de quoi s'amuser et il y en a pour tous les goûts dans ce projet. Et ça tombe bien, avec les grandes vacances, vous avez certainement du temps devant vous, idéal pour contribuer sur un projet unique et engagé (engagez-vous qu'il disait) ! Vous pouvez commencer, par exemple, avec ce tutoriel pour écrire un greffon qui fonctionnera avec tous les frontaux. 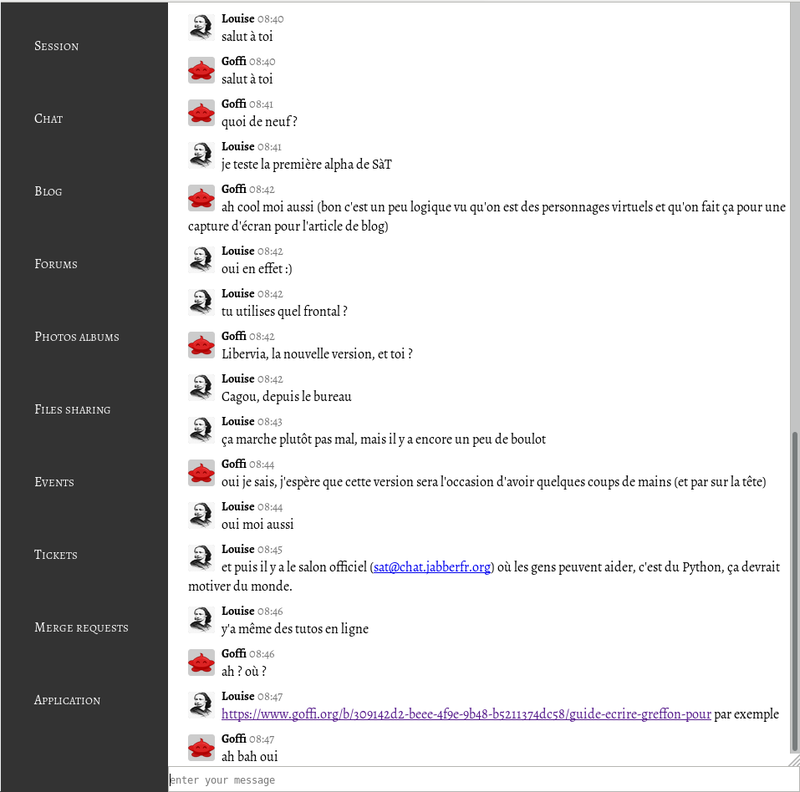 N'hésitez pas à passer sur le salon XMPP de SàT (sat@chat.jabberfr.org, aussi accessible sans compte via le web). Si jamais vous n'avez pas le temps (les pique-niques à plage c'est bien aussi), un soutien sur Liberapay et/ou une adhésion à l'association nous aide. Essayez de faire passer le mot autour de vous, le projet manque de visibilité et a besoin de vous. Si vous souhaitez héberger une instance, vous pouvez commencer à tester (dans une partie « expérimentale/non stable » de votre site), et à nous faire des retours. Nous cherchons aussi du monde pour nous aider à empaqueter partout où c'est possible. Merci d'avance, et à bientôt ! With the recent announcement concerning the biggest known centralized code forge owner change, we have seen back here and there discussions about the creation of a similar tool, but decentralized. I've used this occasion to recall the work done to implement tickets and merge requests in Salut à Toi (SàT), work which was relatively unoticed at the time of writing, about 6 months ago. Now, I would like to bring some details on why building those tools. First of all, why not the big forge? After all, a good part of current libre software is already using it! Well first it's not libre, and we commited ourself in our social contract to use libre software as much as possible, infrastructure included. Then because it's centralized, and there too our social contract is pretty clear, even if it's not as important for infrastructure as it is for SàT itself. Finally, because we are currently using Mercurial, and the most famous forge is build around Git. We do not hide the fact that we already ask ourselves wether to use this platform or not in general assemblee (cf. minutes – in French –), we were mainly interested in the great visibility it can offer. « It's centralized? But "Git" is decentralized! » is a point we are ofter hearing and it's a true fact, Git (and Mercurial, and some others) is decentralized. But a code forge is not the version control system, it's all the tools arount it: hosting, tickets, merge/pull requests, comments, wikis, etc. And those tools are not decentralized at the moment, and even if they are often usable throught a proprietary API, they are still under centralization rules, i.e. rules of the hosting service (and its technical hazards). This also means that if the service doesn't want a project, it can refuse, delete, or block it. Centralization is also a technical facility to catalog and search project… which are on the service. Any external attempt will then have more difficulties to be visible and to attract contributors/users/help. This is a situation we know very well with Salut à Toi (we are not present on proprietary and centralized "social networks" for the same reasons), and we find it unacceptable. It goes without saying that concentrating projects on a single platform is the best way to contribute and exacerbate this state of affairs. Please note, however, that we are not judging or attacking people and projects who made different choices. These positions are linked to our political commitment. Why, then, not using existing Libre projects, already advanced and working, like Gitlab? Well, first because we are working with Mercurial and not Git, and secondly because we would put ourselves here too in a centralized solution. And there is an other point: there are nearly no decentralized forges (Fossil maybe? ), and we already have nearly everything we need with SàT and XMPP. And let's add that there is some pleasure to build the tools we are lacking. SàT is on the way to be a complete ecosystem, offering most, if not all, the tools needed to organise and communicate. But it is also generic and re-usable. That's why the "merge requests" system is not linked to a specific SCM (Git or Mercurial), it can be used with other software, and it is actually not only usable for code development. It's a component which will be used where it is useful. To conclude this post, I would like to remind that if we want to see a decentralized, ethical and politically commited alternative to build our code, organise ourself, and communicate, we can make this real by cooperating and contributing, being with code, design, translations, documentation, testing, etc. We got recently some help for packaging on Arch (thanks jnanar and previous contributors), and there are continuous efforts for packaging in Debian (thanks Robotux, Naha, Debacle, and other Debian XMPP packagers), if you can participate, please contact us (see our official website), together we can make the difference. If you are lacking time, you can support us as well on Liberapay: https://liberapay.com/salut_a_toi. Thanks in advance! Avec la récente annonce concernant le changement de propriétaire de la plus grosse forge centralisée connue, on a vu resurgir ici et là des questionnements sur la création d'un outil similaire mais décentralisé. J'ai profité de l'occasion pour rappeler le travail effectué pour implémenter tickets et requêtes de fusion (« merge requests ») dans Salut à Toi (SàT), travail qui était passé relativement inaperçu quand j'ai écrit à ce sujet, il y a 6 mois. Désormais je souhaite apporter quelques précisions sur le pourquoi de ces outils. Tout d'abord pourquoi pas la grosse forge ? Après tout une importante partie des logiciels libres actuels l'utilise déjà ! D'une part parce que ce n'est pas libre, et nous nous sommes engagés dans notre contrat social à utiliser tant que possible des logiciels libres, y compris pour l'infrastructure. D'autre part parce que c'est centralisé, et là encore notre contrat social est clair à ce sujet, même si c'est moins essentiel pour l'infrastructure que pour SàT lui-même. Enfin parce que nous utilisons à l'heure actuelle Mercurial, et que la forge la plus connue est construite autour de Git. Ne cachons pas toutefois que nous nous sommes déjà posés la question notamment en assemblée générale (cf. les comptes rendus), nous étions intéressés en particulier par la visibilité. « C'est centralisé ? Mais « Git » est décentralisé ! » est une réflexion que l'on entend souvent et elle est vraie, Git (et Mercurial, et d'autres) est décentralisé. Mais une forge n'est pas le gestionnaire de version, c'est tous les outils autour : hébergement, tickets, gestion des modifications (merge/pull requests), commentaires, wikis, etc. Et ces outils là ne sont pas décentralisés à l'heure actuelle, et même s'ils sont souvent accessibles par des API spécifiques aux services, ils restent soumis aux lois de la centralisation, c'est-à-dire du service qui héberge (et des aléas techniques de ce service). Cela veut également dire que si le service ne veut pas d'un projet, il peut le refuser, l'effacer, le bloquer. La centralisation, c'est aussi la facilité pour cataloguer et rechercher… pour les projets qui sont sur ce service. Rendant de facto toute tentative extérieure moins visible et donc augmentant ses difficultés. C'est une situation que nous connaissons bien avec Salut à Toi (nous sommes également absents des « réseaux sociaux » propriétaires et centralisés pour les mêmes raisons), et que nous jugeons inacceptable. Il va sans dire que se concentrer sur une plateforme ne fait qu'encourager et prolonger cet état de fait. Notons tout de même qu'il n'est pas question ici de dénigrer ceux qui ont fait des choix différents, ces réflexions étant liées à notre implication politique forte et les contraintes changent d'un cas à l'autre. Pourquoi, alors, ne pas utiliser des projets libres existants, avancés et fonctionnels comme Gitlab ? D'une part parce que nous travaillons avec Mercurial et non Git, et d'autre part parce que nous serions là aussi dans la centralisation. Il y a une autre raison : c'est qu'il n'existe pas ou peu (Fossil peut être ?) de forges décentralisées, et nous avons déjà tout ce qu'il nous faut avec SàT et XMPP. Et puis il y a un certain plaisir à créer les outils qui nous manquent. SàT se veut un écosystème complet, offrant la majeure partie si ce n'est tous les outils nécessaires pour s'organiser et communiquer. Mais il est aussi générique et réutilisable. C'est pourquoi le système de « merge requests » n'est pas lié à un outil particulier (Git ou Mercurial), il peut être utilisé avec d'autre logiciels, et n'est d'ailleurs par réservé au développement de code. C'est une autre brique qui sera utilisée là où ça sera utile. Pour conclure, je rappelle que si vous voulez voir une alternative décentralisée, éthique et engagée pour construire nos logiciels, nous organiser et communiquer, on peut la rendre possible en coopérant et contribuant, que ce soit avec du code, de la conception graphique (design), des traductions de la documentation des tests, etc. Nous avons récemment eu de l'aide pour l'empaquetage sur Arch (merci à jnanar et aux mainteneurs précédents), et il y a des efforts continus pour l'empaquetage sur Debian (merci à Robotux, Naha, Debacle et les autre empaqueteur XMPP sur Debian). Si vous pouvez participer, merci de regarder comment nous contacter sur le site officiel), ensemble on peut faire la différence. Si vous manquez de temps, vous pouvez aussi nous soutenir sur Liberapay: https://liberapay.com/salut_a_toi. Merci d'avance !